Allison Carmody visited her grandmother Mary whenever she could, even though her grandmother lived about 2 hours south of her near Milwaukee in a senior living environment. Over time Allison noticed her grandmother becoming more withdrawn and distant. It was as if she was becoming depressed. Allison worried for her grandmother, felt a deep sense of guilt that she wasn’t doing enough and didn’t know where to turn. Being such a long distance away made it difficult to visit regularly. This is a very common issue for millions of family caregivers who worry about the physical and mental well being of a loved one. Seniors want to stay engaged with family, they want to feel vital and most of all, they want to feel dignified. “With 10,000 boomers turning 65 everyday for the next 20 years, we see more and more innovative solutions being brought to the market," says Lynn Wilson, Founder of The CareGiver Partnership. In this post, I am highlighting a useful device that I think can help and share a real world story of how it helped potentially save a life. The simple to use device allows a loved one to have video calls with family members, exchange mail, pictures, music and more. It's called VideoCare. We’re having company... but they’re 200 miles away. When Kelly Ilnicki’s grandmother Mary, started using VideoCare, it became a lot easier for Kelly, her dad and her uncle to visit with and check in on her -- from 200 miles away. The system’s touch-screen meant her grandma didn't need to type on a keyboard or figure out how to use a mouse or even use a computer -- which she was totally unfamiliar with. She could just touch Kelly’s picture on the screen and the system would call her. Kelly says she often just sat at or nearby her own screen while her grandma watched TV, just so her grandma would have some company; a comfort her grandma enjoyed. One day while Kelly and her grandma were using it to chat, Kelly noticed her grandma slump to the side as if she was passing out or having a stroke. Kelly kept talking to her grandma to keep her engaged as best she could while observing her. Kelly was able to contact paramedics, direct them to her grandma and walk them through what had occurred even though she was many miles away. The paramedics say the outcome could have been much worse if Kelly had not been in a video chat with her grandma when the incident happened. Since then, Kelly and her family have moved her grandma closer to them but they still visit with her using the device. Providing the benefits in a very simple tool is.... well - hard. VideoCare allows seniors to connect remotely with their caregivers and loved ones, and was created to answer the simple question: ‘How can we take better care of an aging parent when that parent lives hundreds or thousands of miles away?’ While computers, smart phones and other technology devices can significantly enhance many personal and professional lives, the reality is that millions of seniors are simply shut out of the technology world; often due to lack of interest or feeling intimidated by technology. Taking the complexity out of computing and shifting the technical burden away from the senior user is critical.’ There’s no keyboard, no mouse and no technical skill needed. The user doesn’t have to know anything about computers. Users can receive and view photos and videos instantly, enjoy streaming music, and receive important medication reminder messages -- just by touching the screen. When a family member or other caregiver calls, that user will know who it is because the person’s photo will appear on the screen. “This can be a valuable tool to help seniors maintain their independence, social connections and dignity” says Lynn Wilson, Founder of The CareGiver Partnership. I plan to get one of these for my Mom. For both family and professional caregivers it provides piece of mind and can help alleviate worry about their parent or grandparent being isolated from others. For family members who worry because they are can’t make frequent trips to visit their parent or grandparent, it allows them to ‘see’ that senior more often – providing the opportunity to address any physical, emotional or caregiving issues earlier on. Caregivers don’t have to be worried about security when using VideoCare. User management is handled remotely by the family, and they can control who has access to communicate with the senior user. 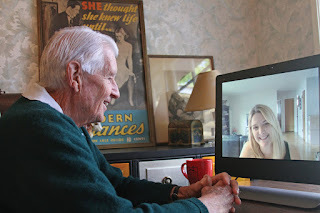 Whether a senior is in assisted living, a nursing home facility, or still living independently in their own home, VideoCare can be a worthwhile option for keeping them connected to caregivers and loved ones. The ability to socialize, even remotely, with the help of ‘easy’ technology can make a significant and positive difference in a senior’s outlook and quality of life. Caregivers, senior care recipients, and home healthcare professionals who are interested in learning more about the VideoCare system(s) can call 650-933-5150 or visit the company’s website at www.videocare.com. VideoCare is based in Menlo Park, CA. Mention The CareGiver Partnership if you call. What The Heck Is Universal Design, Aging in Place and All These Other Goofy Terms? About The CareGiver Partnership. The CareGiver Partnership helps caregivers and their loved ones with answers to their caregiving questions, including information about home health care products and supplies, from our Wisconsin-based team of Product Specialists who are all current or former caregivers. The company’s Web site provides the largest online library of resources on subjects most important to caregivers — from arthritis to assisted living, and Parkinson’s to prostate cancer — as well as access to more than 3,000 home care products for incontinence, skin care, mobility, home safety and daily living aids. The CareGiver Partnership was founded in 2004 by Lynn Wilson of Neenah, Wisc. Visit The CareGiver Partnership to learn more or call 1-800-985-1353.